Once you've had a project around for a while, it's inevitable that dependency updates will become available. Unfortunately, npm (the Node Package Manager), while excellent at everything else, is completely terrible at notifying you about updates. Speaking of npm package dependencies, the other big issue is security vulnerabilities. GitHub have recently started giving maintainers of projects notifications about security vulnerabilities in their dependencies, which I think is a brilliant idea. Actually fixing said vulnerabilities is a whole other issue though. If you don't want to update all the dependencies of a project to the latest version (perhaps you're just doing a one-off contribution to a project or aren't very familiar with the codebase yet), there's another tool - this time built-in to npm - to help out - the npm audit subcommand. This helps out a ton with contributing to other projects. Issues arise when the vulnerabilities are not in packages you directly depend on, but instead in packages that you indirectly depend on via dependencies of the packages you've installed. Thankfully the vulnerabilities in the above can all be traced back to development dependencies (and aren't essential for Peppermint Wiki itself), but it's rather troubling that I can't install updated packages because the packages I depend on haven't updated their dependencies. I guess I'll be sending some pull requests to update some dependencies! 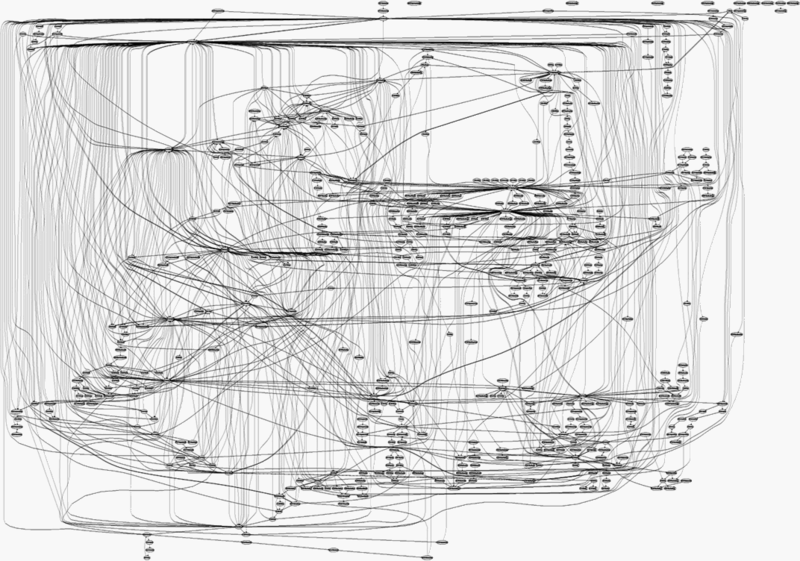 To help me in this, the output of npm audit even displays the dependency graph of why a package is installed. If this isn't enough though, there's always the npm-why which, given a package name, will figure out why it's installed. Found this interesting? Got a better solution? Comment below! I've generated Atom feeds in PHP before, but recently I went on the hunt to discover if PHP has something like C&sharp;'s XMLWriter class - and it turns out it does! Although poorly documented (probably why I didn't find it in the first place :P), it's actually quite logical and easy to pick up. To this end, I thought I'd blog about how I used to write the Atom 1.0 feed generator for recent changes on Pepperminty Wiki that I've recently implemented (coming soon in the next release! ), as it's so much cleaner than atom.gen.php that I blogged about before! It's safer too - as all the escaping is handled automatically by PHP - so there's no risk of an injection attack because I forgot to escape a character in my library code. It ends up being a bit verbose, but a few helper methods (or a wrapper class?) should alleviate this nicely - I might refactor it at a later date. To begin, we need to create an instance of the aptly-named XMLLWriter class. It's probable that you'll need the php-xml package installed in order to use this. In short, the above creates a new XMLWriter instance, instructs it to write the XML to memory, enables pretty-printing of the output, and writes the standard XML document header. Next, we probably want to advertise how the Atom feed was generated. Useful for letting the curious know what a website is powered by, and for spotting usage of your code out in the wild! That full_url() function is from StackOverflow, and calculates the full URI that was used to make a request. As Pepperminty Wiki can be run in any directory on ayn server, I can't pre-determine this url - hence the complexity. The <updated /> tag specifies when the feed was last updated. It's unclear as to whether it's the date/time the last change was made to the feed or the date/time the feed was generated, so I've gone with the latter. If this isn't correct, please let me know and I'll change it. The <id /> element can contain anything, but it must be a globally-unique string that identifies this feed. I've seen other feeds use the canonical url - and I've gone to the trouble of calculating it for the <link rel="self" /> - so it seems a shame to not use it here too. PHP even has a present for generating a date string in the correct format required by the spec :D $settings is an object containing the wiki settings that's a parsed form of peppermint.json, and contains useful things like the wiki's name, icon, etc. <title /> - The title of the article. Easy peasy! <id /> - Just like the id of the feed itself, each article entry needs an id too. Here I've followed the same system I used for the feed, and given the url of the page content. <updated /> - The last time the article was updated. Since this is part of a feed of recent changes, I've got this information readily at hand. <content /> - The content to display. If the content is HTML, it must be escaped and type="html" present to indicate this. <link rel="alternate" /> Same deal as above, but on an article-by-article level. In this case, it should link to the page the article content is from. In this case, I link to the page & revision of the change in question. In other cases, you might link to the blog post in question for example. <author /> - Can contain <name />, <uri />, and <email />, and should indicate the author of the content. In this case, I use the name of the user that made the change, along with a link to their user page. I've omitted the logic that generates the value of the <content /> tag, as it's not really relevant here (you can check it out here if you're curious :D). Then we can do whatever we want to with the generated XML! ...this is from my local development instance. Found this interesting? Confused about something? Want to say hi? Comment below! A little while ago I was asked about generating a wordsearch in a custom shape. I thought to myself "someone has to have built this before...", and while I was right to an extent, I couldn't find one that let you use any shape you liked. While I wrote it a little while ago, I apparently never got around to posting about it on here. In short, it works by using an image you drop into the designated area on the page as the shape the word search should take. Each pixel is a single cell of the word search - with the alpha channel representing whether or not a character is allowed to be placed there (transparent means that it can't contain a character, and opaque means that it can). Creating such an image is simple. Personally, I recommend Piskel or GIMP for this purpose. Once done, you can start building a wordlist in the wordlist box at the right-hand-side. It should rebuild the word search as soon as you click out of the box. If it doesn't, then you've found a bug! Please report it here. With the word search generated, you can use the Question Sheet and Answer Sheet links to open printable versions for export. The most complicated part of this was probably the logistics behind rude word removal. Thankfully, I did't have to find and maintain such a list of words, as the futility npm package does this for me, but algorithmically guaranteeing that by censoring 1 rude word another is not accidentally created in another direction is a nasty problem. If you're interested in a more technical breakdown of one (or several!) particular aspects of this - let me know! While writing about all of it would probably make for an awfully long post, a specific aspect or two should be more manageable. In the future, I'll probably revisit this and add additional features to it, such as the ability to restrict which directions words are placed in, for example. If you've got a suggestion of your own, open an issue (or even better, open a pull request :D)! After writing the post that will be released after this one, I realised that I made a critical assumption that everyone knew what an inverted index was. Upon looking for an appropriate tutorial online, I couldn't find one that was close enough to what I did in Pepperminty Wiki, so I decided to write my own. First, some context. What's Pepperminty Wiki? Well, it's a complete wiki engine in a single file of PHP. The source files are obviously not a single file, but it builds into a single file - making it easy to drop into any PHP-enabled web server. One of its features is a full-text search engine. A personal wiki of mine has ~75k words spread across ~550 pages, and it manages to search them all in just ~450ms! It does this with the aid of an inverted index - which I'll be explaining in this post. First though, we need some data to index. How about the descriptions of some video games? In KSP, you must build a space-worthy craft, capable of flying its crew out into space, without killing them. At your disposal is a collection of parts, which must be assembled to create a functional ship. Each part has its own function and will affect the way a ship flies (or doesn't). So strap yourself in, and get ready to try some Rocket Science! Meet Lea as she logs into an MMO of the distant future. Follow her steps as she discovers a vast world, meets other players and overcomes all the challenges of the game. Fort Meow is a physics game by Upper Class Walrus about a girl, an old book and a house full of cats! Meow. Factory balls is the brand new bonte game I already announced yesterday. Factory balls takes part in the game design competition over at jayisgames. The goal of the design competition was to create a 'ball physics'-themed game. I hope you enjoy it! Notice how we've removed punctuation here, and made everything lowercase. This is important for the next step, as we want to make sure we consider Factory and factory to be the same word - otherwise when querying the index we'd have to remember to get the casing correct. Very cool. Now we can generate an index for each page's content. The next step is to turn this into an inverted index. Basically, the difference between the normal index and a inverted index is that an entry in an inverted index contains not just the offsets for a single page, but all the pages that contain that token. For example, the Cross-Code example above also contains the token game, so the inverted index entry for game would contain a list of offsets for both the Factory Balls and Cross-Code pages. There - much better. In Pepperminty Wiki, this is handled by the ids class, which has a pair of public methods: getid($pagename) and getpagename($id). If an id can't be found for a page name, then a new id is created and added to the list (Pepperminty Wiki calls this the id index) transparently. Similarly, if a page name can't be found for an id, then null should be returned. Note how there isn't an entry for page id 1, as the Kerbal Space Program page doesn't contain the token game. This, in essence, is the basics of inverted indexes. A full inverted index will contain an entry for every token that's found in at least 1 source document - though the approach used here is far from the only way of doing it (I'm sure there are much more advanced ways of doing it for larger datasets, but this came to mind from reading a few web articles and is fairly straight-forward and easy to understand). Can you write a program that generates a full inverted index like I did in the example above? Try testing it on the test game descriptions at the start of this post. You may also have noticed that the offsets used here are of the tokens in the list. If you wanted to generate contexts (like Duck Duck Go or Google do just below the title of a result), you'd need to use the character offsets from the source document instead. Can you extend your program to support querying the inverted index, generating contexts based on the inverted index too? Liked this post? Got your own thoughts on the subject? Having trouble with the challenges at the end? Comment below! Quest Get: Search large amounts of code! Recently I was working on a little project of mine (nope, not this for once! :P), and I needed a C&sharp; class I'd written a while ago. Being forgetful as I am, I had no idea which of my project I'd written it for. And so the quest began to find it! I did in the end, but it left me thinking whether there was a better way to search all my code quickly. This post is the culmination of everything I've discovered so far about the process of searching one's code. Before I started, I already know about grep, which is built into almost every Linux system around. It's even available for Windows via the MSYS Tools. Unfortunately though, despite it's prevailance, it's not particularly good at searching large numbers of git repositories, as it keeps descending into the .git folder and displaying a whole load of useless results. Something had to change. After asking reddit, I was introduced to OpenGrok. Written in Java, it indexes all of your code, and provides a web interface through which you can search it. Very nice. Unfortunately, I had trouble figuring out the logistics of actually getting it to run - and discovered that it takes multiple hours to set up correctly. Moving on, I was re-introduced to ack, written in plain-old Perl, it apparently runs practically any system that Perl does - though it's not installed by default like grep is. Looking into it, I found it to be much like grep - only smarter. It ignores version control directories (like the .git folder ), and common package folders (like node_modules) by default, and even has a system by which results can be filtered by language (with support for hash-bangs too!). The results themselves are coloured by default - making it easy to skim through quickly. Coupled with the flexible configuration file system, ack makes for a wonderfully flexible way to search through large amounts of code quickly. Though ack looks good, I still didn't have a way to search through all my code that scattered across multiple devices at once, so I kept looking. The next project I found (through alternative to actually) was Text Sherlock. It positions itself as an alternative to OpenGrok that's much simpler to configure. True to its word, I managed to get a test instance set up running from my /tmp directory in 15 minutes - though it did take a while to index the code I had locally. It also took several seconds to consult its index when I entered a query. I suspect I could alleviate both of these issues by installing Xapian (an open-source high-performance search library), which it appears to have support for. While the interface was cool, it didn't appear to allow me to tell it which directories not to index, so it ended trawling through all my .git directories - just like grep did. It also doesn't appear to multi-threaded - so it took much longer to index my code than it really needed to (I've got a solid-state drive and enough RAM for a few GBs of cache, so the indexing operation was CPU-bound, not I/O-bound). In the end, I've rediscovered the awesome search tool ack, and taken a look at the current state of code search tools today. While I haven't yet found precisely what I'm looking for, I'm further forward than when I started. Got a cool way to search through all your code? Did this help you out? Comment below! So there I was. It was a lazy afternoon before my final exam of the semester, and I was idly looking through some old code. One thing led to another, and I ended up writing a line-based scanning lexer in C# - and I thought I'd share it here, pulling it apart and putting it back together again. The aim was to build something regular expression based, that would be flexible enough that it could be used in a wide-range of applications - but not too difficult or confusing to pick up, use and add to another project. The final code isn't currently available in a public repository (it's actually for a personal project - maybe I'll get around to refactoring it into a library if there's the demand), but I'll still post the finished code at the end of this post. Here I define a template (or generic) class that holds a regular expression, and associates it with a value from an enum. There's probably a better / cleaner way to make sure that TokenType is an enum, but for now this should serve it's purpose just fine. I also add a simple Enabled boolean property - as we'll be adding support for dynamically enabling and disabling rules later on. A little more complex, but still manageable. It, like it's LexerRule cousin, is also a template (or generic) class. It holds the type of token it is and the regular expression Match object generated during the scanning process. It also has something strange going on with Value and nullValueData - this is such that we can emit tokens with an 'unknown' type (more on that later) for the text in between that doesn't match any known rule. We'll be covering this later too. There - that should do the trick! CurrentLineNumber, CurrentLinePos, and TotalCharsScanned are properties to keep track of where we've got to, and textStream is the StreamReader we'll be reading data from. Then, we've got some methods that will add new lexer rules to Rules enable and disable rules by token type, a method to initialise the lexer with the correct textStream, and finally a generator method that will emit the tokens. This set of methods let us enable or disable rules based on what they are with. For example, if I have the 3 rules CommentStart, CommentEnd, and FunctionStart, then calling EnableRulesByPrefix("Comment") will enable CommentStart and CommentEnd, but not FunctionStart. Also fairly easy to follow. Basically, we clear the matches list, and then attempt to find the next match from the current position on the line that we've reached (CurrentLinePos) for every rule - and we store all the successful matches for further inspection and processing. We also make sure we skip any disabled rules here, too. Since the value Unknown is explicitly assigned the index 0, we can be absolutely certain that it's the default value of this enum. /// The number of the line that currently being scanned. /// The number of characters on the current line that have been scanned. /// The total number of characters currently scanned by this lexer instance. /// Only updated every newline! Very cool! This could easily be extended to support more of the LOGO syntax. As an exercise, can you extend it to support the REPEAT statement? At some point in the future, I might go even further and build a bottom-up left-to-right shift-reduce parser, and combine it with this lexer and some BNF to create a parse tree. Enjoyed this post? Don't quite understand something? Think you could do better? Post a comment below! GlidingSquirrel is now on NuGet with automatic API documentation! While these enhancements have been driven mainly by a certain project of mine that keeps stealing all of my attention, they've been fun to add - and now that I've (finally!) worked out how to package it as a NuGet package, it's available on NuGet for everyone to use, under the Mozilla Public License 2.0! Caution should be advised though, as I've not thoroughly tested it yet to weed out the slew of bugs and vulnerabilities I'm sure are hiding in there somewhere - it's designed mainly to sit behind a reverse-proxy such as Nginx (not that's it's any excuse, I know!) - and also I don't have a good set of test cases I can check it against (I thought for sure there would be at least one test suite out there for HTTP servers, considering the age of the protocol, but apparently not!). The above goes inside the <metadata> element. If you're curious about what this strange .nuspec file is and it's format, I've blogged about it a while back when I figured out how to package my TeleConsole Client - in which I explain my findings and how you can do it yourself too! In addition to packaging it and putting it up on NuGet, I've also taken a look at automatic documentation generation. For a while I've been painstakingly documenting the entire project with intellisense comments for especially this purpose - which I'm glad I started early, as it's been a real pain and taken a rather decent chunk of time to do. Anyway, with the last of the intellisense comments finished today, I set about generating automatic documentation - which turned out to be a surprisingly difficult thing to achieve. Sandcastle, Microsoft's offering has been helpfully discontinued. Sandcastle Help File Builder, the community open-source fork of Sandcastle, appears to be Windows-only (I use Linux myself). DocFX, Microsoft's new offering, appears to be more of a static site generator that uses your code and a bunch of other things as input, rather than the simple HTML API documentation generator I was after. I found Docxygen to produce an acceptable result out-of-the-box, I discovered that configuring it was not a trivial task - the initial configuration file the init action created was over 100 KiB! I found a few other options too, but they were either Windows-only, or commercial offerings that I can't justify using for an open-source project. When I was about to give up the search for the day, I stumbled across this page on generating documentation by the mono project, who just happen to be the ones behind mono, the cross-platform .NET runtime that runs on Linux, macOS, and, of course, Windows. They're also the ones who have built mcs, the C&sharp; compiler that compliments the mono runtime. Apparently, they've also built a documentation generation that has the ability to export to HTML. While it's certainly nothing fancy, it does look like you've all the power you need at your fingertips to customise the look and feel by tweaking the XSLT stylesheet it renders with, should you need it. The first command builds the multi-page XML tree from the XML documentation generated during the build process (make sure the "Generate xml documentation" option is ticked in the project build options! ), and the second one transforms that into HTML that you can view in your browser. This outputs the documentation to the docs/ folder in the root of the solution. If you're a bit confused as to how to utilise this in your own project, then perhaps the Untangling MSBuild post I wrote to figure out how MSBuild works can help! You can view the GlidingSquirrel's automatically-generated documentation here. It's nothing fancy (yet), but it certainly does the job. I'll have to look into prettifying it later! For a project of mine (which I might post about once it's more stable), I'm going to need a way to find the distance to a point from the mouse cursor to implement an eraser. I've attempted this problem before - but it didn't exactly go to plan. To that end, I decided to implement the algorithm on its own to start with - so that I could debug it properly without all the (numerous) moving parts of the project I'm writing it for getting in the way. As you may have guessed since you're reading this post, it actually went rather well! Using the C++ implementation on this page as a reference, it didn't take more than an hour or two to get a reasonable implementation working - and it didn't take a huge amount of time to tidy it up into an npm package for everyone to use! The code behind it is actually quite simple - just rather full of nasty maths that will give you a headache if you try and understand it all at once (I broke it down, which helped). The library exposes multiple methods to detect a point's distance from different kinds of line - one for multi-segmented lines (which I needed in the first place), one for a single (finite) line (which the multi-segmented line employs), and one for a single infinite line - which I implemented first, using this Wikipedia article - before finding that it was buggy because it was for an infinite line (even though the article's name is apparently correct)! I've written up a usage guide if you're interested in playing around with it yourself. I've also got another library that I've released recently (also for Nibriboard) that simplifies multi-segmented lines instead of finding the distance to them, which I may post about about soon too! Got a question? Wondering why I've gone to the trouble of implementing such an algorithm? Comment below - I'd love to hear your thoughts! So there I was. I'd just got home, turned on my laptop, opened the Arduino IDE and Monodevelop, and then.... nothing. I knew I wanted my PixelBot to talk to the PixelHub I'd started writing, but I was confused as to how I could make it happen. In this kind of situation, I realised that although I knew what I wanted them to do, I hadn't figured out the how. As it happens, when you're trying to get one (or more, in this case) different devices to talk to each other, there's something rather useful that helps them all to speak the same language: a protocol. A protocol is a specification that defines the language that different devices use to talk to each other and exchange messages. Defining one before you start writing a networked program is probably a good idea - I find particularly helpful to write a specification for the protocol that the program(s) I'm writing, especially if their function(s) is/are complicated. To this end, I've ended up spending a considerable amount of time drawing up the PixelHub Protocol - a specification document that defines how my PixelHub server is going to talk to a swarm of PixelBots. It might seem strange at first, but I decided on a (mostly) binary protocol. Upon closer inspection though, (I hope) it makes a lot of sense. Since the Arduino is programmed using C++ as it has a limited amount of memory, it doesn't have any of the standard string manipulation function that you're used to in C&sharp;. Since C++ is undoubtedly the harder of the 2 to write, I decided to make it easier to write the C++ rather than the C&sharp. Messages on the Arduino side are come in as a byte array, so (in theory) it should be easy to pick out certain known parts of the array and cast them into various different fundamental types. With the specification written, the next step in my PixelBot journey is to actually implement it, which I'll be posting about in the next entry in this series! After many attempts and solving many problems, I've finally gotten my Wemos-powered PixelBot to connect via TCP to a C# server component I've written. Since I experienced so many problems with it, I decided to post about it here to help others who want to do the same as I. The first (and arguably most difficult) hurdle I came across was the lack of correct information. For one, the TCP client class is actually called WifiClient (which is confusing in and of itself). For another, there aren't any really good tutorials out there that show you what to do. In addition, I wanted to build a (rather complicated as it turns out!) auto discovery system to allow my PixelBot to find the PixelHub (the server) automatically. As usual, there was even less information about this task! All I found was an outdated guide and rather simplistic example. I ended up inspecting the header file of the WiFiUDP class in order to figure it out. In this post, I'm going to explain how I got the autodiscovery mechanism working. Before we begin, you need to understand what multicast UDP is and how it works. For those of you who don't, I've posted all about it. The PixelBots connect to the PixelHub server using the credentials that it found in the beacon pings it decoded! In order to receive these beacon pings, we need to set up a UDP listener and wire it up to receive multicast packets. In the following example I'm multicasting on 239.62.148.30 on port 5050. // Don't overflow the message buffer! Phew! That's a lot of code! I've tried to annotate it the best I can. The important variables in the are serverIp the serverPort - they hold the IP address and the port number of the remote machine that we want to connect to.